CFO Indra Nooyi to succeed Steve Reinemund, putting her among the leading women in corporate America. NEW YORK (CNNMoney.com) -- Soft drink and snack company PepsiCo Inc. announced Monday that chief financial officer Indra Nooyi will take over from Chairman and CEO Steve Reinemund this October. She becomes the first woman to hold the post and enters the list of leading women in corporate America. Reinemund, who has seen PepsiCo (Charts) pass rival Coca-Cola (Charts) in terms of market capitalization in December for the first time in its history, will remain as chairman of the company until his retirement. Pepisco Chief Financial Officer Indra Nooyi, who will assume the CEO job in October. Indian-born Nooyi, who was ranked No. 11 in Fortune's list of the most powerful women in business, joined the company in 1994 and was named CFO in 2001. Reinemund cited personal reasons for his decision to retire. "My family is entitled to more time from me than the responsibilities and obligations of continuing as PepsiCo's CEO requires and deserves," Reinemund said in a statement. "It was, in many respects, the toughest and easiest decision of my life." "Steve did a remarkable job in maintaining discipline and consistency at Pepsi over the last several years. Indra is a supertalent. No doubt, under her leadership, Pepsi will not miss a beat in this transition," said John Sicher, editor of trade publication Beverage Digest. Nooyi's current responsibilities will be divided between two PepsiCo veterans: Richard Goodman, who is CFO of PepsiCo International and Hugh Johnston who is currently a senior vice president with the company. She becomes the fifth CEO in PepsiCo's 41-year history. As CFO, analysts credited her with transforming the company's global strategy at a time when both Coke and Pepsi face a challenging sales environment in their core domestic market for core carbonated soft drinks as more health-conscious consumers buy more juices and water. Nooyi was the primary architect of PepsiCo's restructuring, including the divestiture of its restaurants into YUM! Brands (Charts), the spinoff and IPO of company-owned bottling operations into Pepsi Bottling Group (Charts), the acquisition of Tropicana and Pepsi's merger with Quaker Oats. 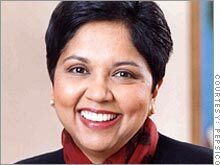 Prior to joining Pepsi, Nooyi's other corporate jobs included vice president and director of corporate strategy and planning at Motorola and consultant with Boston Consulting Group. "Indra's is brilliant in terms of business strategy. She's someone who can think and move several steps ahead in this game of business chess," said Sicher of Beverage Digest. Morningstar analyst Matt Riley wrote in a research note Monday that Nooyi was already being groomed as Reinemund's heir apparent and therefore would be well prepared to handle her new role. Shares of PepsiCo were up less than 1 percent in early trading Monday following the announcement. -- CNNMoney.com senior writer Chris Isidore contributed to this report.